The historic Dale Mining District is today one of California’s most well-known ghost towns. For several years it was one of the most active gold mining towns in the country. Located roughly 15 miles southeast of Twentynine Palms in the hot desert region of California, the Dale Mining District got its name from the nearby town of Dale City. The Dale Mining District stands as a lesson of how gold can create nearly instant wealth and opportunities that dry up as quickly as the gold is mined. The remaining buildings and equipment stand as a testament to what was once a very prosperous area in a place that otherwise people would not be. The climate in the summer here is harsh and unforgiving. The Dale Mining District came to life in 1881 when the first reports of gold came from an area located in the Pinto Mountains. It did not take long for people to hear of these reports and from all over the country they came to strike it rich. By 1898, the gold production reached its peak with up to 3,000 miners in the district digging for gold. In addition, there were thousands more who came to support the miners with their stores, wares and supplies that helped form the first town. Dale City came to life in 1884 as it was formed around a well that had been dug to provide water. Dale City continued to grow until water was being pumped to the mines in 1899. This was an important turning point for the town itself, since with the water being pumped to the mine owners there was no reason for them to bring their gold ore to Dale City for milling purposes. Because of this, the town itself uprooted and moved to a new site just six miles south and formed was called New Dale. The location was smartly chosen as the location was between the two largest producing mines in the region, the OK and Supply mines. The town of New Dale continued to prosper until 1917 when the gold productions started to diminish, and the OK and Supply mines were closed down. At that point, New Dale was abandoned along with the thousands of miners that had occupied the area. As with most mining districts across California and the western United States, the area boomed for a short time, then slowly shrunk as miners left to explore new areas. Only a few small mining operations remained and they continued until the outbreak of World War II when all mines were ordered closed by the President of the United States, ending an era in gold mining in the region. The Dale Mining District is once again attracting the attention of modern day prospectors searching for gold. 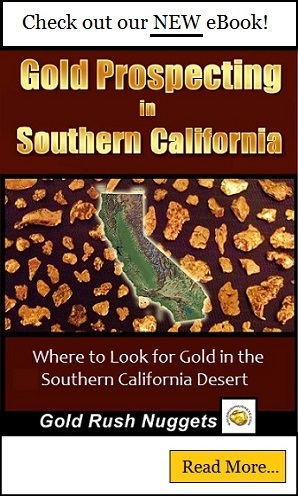 Modern drywashers and metal detectors will still produce gold here, and it is a popular area for prospectors in Southern California. The remains of the two separate towns that were constructed along with the mining areas consist of foundations, rotting wooden structures and even some of the old mining equipment that was used along with the mine shafts that stand empty. Along with the recreational mining that takes place in the region, the area is also a spot for tourists to learn about the history of gold mining here, and to see a glimpse of its past still preserved in the dry, scorching heat that is the Dale Mining District.